This spread includes the happiest images of the whole album I designed for this Black Creek Pioneer Village wedding www.bycalin.com/black-creek-pioneer-village-wedding. The left photo, taken during the ceremony that took place in the Fisherville wedding chapel is one the best I have taken in a while. The couple's son is holding a handwritten sign that states "She Said YES!" The unique sign accompanied by the son's mischievous look make the photo extremely priceless. 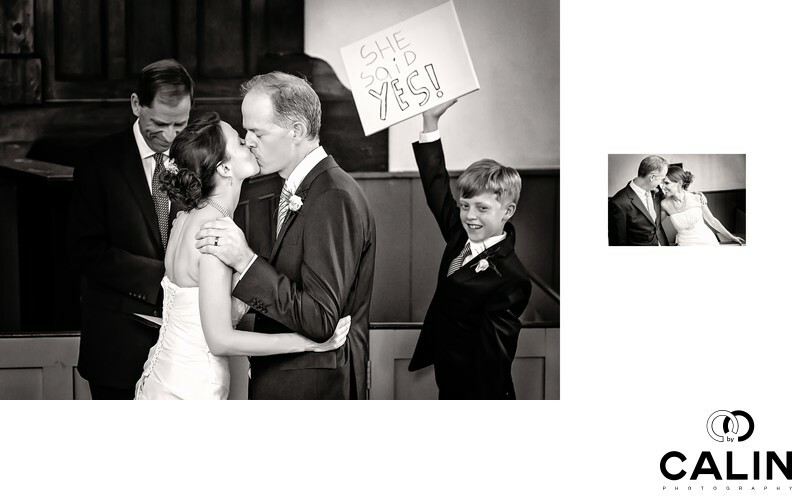 At the beginning of the wedding day, before we went to the venue, the little boy shared with me his intent to pull that sign during the ceremony. The second image on the right captures the reaction of the bride and groom seconds after they signed the marriage registry. Obviously relieved after the solemn moment of signing the marriage papers, they are now ready to party and are oblivious to the rest of the world. That allowed me to capture them touching their foreheads and giggling. This is a time where I should mention that only on officiant registered with the Office of the Register General can perform your wedding ceremony according to the Ontario Marriage Act. As a photographer, I love when couples display their love openly on the big day. That makes my work easier and improves the quality of the wedding photos. Even the best portrait and wedding photographers in Toronto can not elicit these emotions that occur naturally. As one of the masters of wedding photography - Cliff Mautner" said, "on the big day, we are as good as our clients allow us to be." The best wedding photography is about emotions and this rustic wedding gave me a lot of opportunities for candid pictures besides beautiful portraits in the garden and other places in the complex.